KUALA LUMPUR: Share prices on Bursa Malaysia turned mixed at mid-morning today, with investors adopting a wait-and-see approach to the 15th Invest Malaysia forum, the largest capital market event in the country, while tracking the easier regional market sentiment. 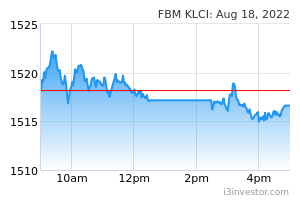 At 11 am, the benchmark FTSE Bursa Malaysia KLCI (FBM KLCI) was 0.70 of-a-point better at 1,691.64 from Monday's close of 1,690.94. The index opened 1.54 points firmer at 1,692.48. Market breadth was negative with losers thumping gainers 397 to 210, 337 counters unchanged, 944 untraded and 21 others suspended. Turnover was at 1.21 billion shares worth RM542.46 million. A dealer said Malaysia's investing fraternity had chose to remain on the sidelines and kept an eye on the on-going two-day forum, starting today, for further investment directions. Regionally, the Singapore's Straits Times Index slid 0.14 per cent to 3,208.34, Japan's Nikkei eased 0.26 per cent to 21,528.38 and Hong Kong's Hang Seng Index was 0.09 per cent weaker at 29,383.64. "Regional stock markets were on a downtrend with investors cautious ahead of the US Federal Reserve meeting on March 19-20," the dealer said. Among heavyweights, Maybank and Petronas Chemicals bagged one sen each to RM9.50 and RM9.26, Tenaga rose 14 sen to RM13.20, while Public Bank and CIMB were unchanged at RM24.48 and RM5.48, respectively. Of the most actives, Sapura Energy and its warrant were one sen easier each at 35 sen and 13.5 sen, Dayang declined 15 sen to RM1.47, Perdana Petroleum fell 4.5 sen to 40 sen, while Metronic Global inched up two sen to 9.5 sen.
Magni-Tech topped the gainers’ list, gaining 19 sen to RM4.85 while Petronas Dagangan led the losers list after falling 30 sen to RM24.80. The FBM Emas Index was 9.93 points weaker at 11,806.82, the FBMT 100 Index shed 2.25 points to 11,661.09 and the FBM Emas Shariah Index eased 14.02 points to 11,829.84. The FBM Ace Index decreased 38.11 points to 4,863.67 and the FBM 70 was 31.64 points lower at 14,205.83. Sector-wise, the Financial Services Index gained 9.74 points to 17,509.74, the Industrial Products and Services Index ticked up 0.09 of-a-point to 170.98, while the Plantation Index declined 25.33 points to 7,260.30.